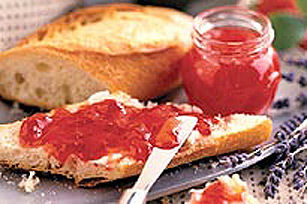 Stock up on summer flavour with our 1-2-3-4 Strawberry Freezer Jam. There's no cooking required for this quick and easy freezer strawberry jam - you won't believe how simple it is! Crush firm, ripe strawberries with masher in the Tupperware® Thatsa Bowl. Measure 1 3/4 cups crushed strawberries into a second bowl. Stir in 4 cups sugar and let stand 10 minutes. Stir IN 2 Tbsp. lemon juice and 1 pouch Certo Liquid Pectin. Continue stirring a full 3 minutes. Spoon into Tupperware® FreezeSmart Containers, seal and freeze up to 1 year.